After 20-years of interactive movies masquerading as RPGs I’ve honestly had enough. I really wish Square Enix would say “We’re making a 16-bit style RPG just like we used to!” not that I really trust the current day Square Enix to actually do it right, but I’d still want it. 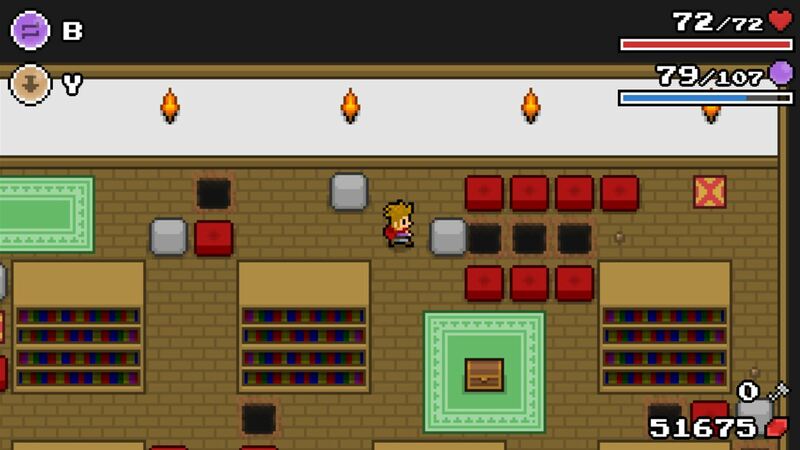 So what is a retro RPG fan to do since none of the big RPG players will bother to make a new oldschool RPG? Rely on indie devs, of course! Stories of Bethem: Full Moon is a 16-bit Zelda-style action RPG with great presentation, awesome classic gameplay, and more charm than SE has mustered in decades. It is a perfect oldschool homage to some of the best games from the best era of gaming ever and you can play it right now on your Xbox One. See our full Stories of Bethem: Full Moon review for details. 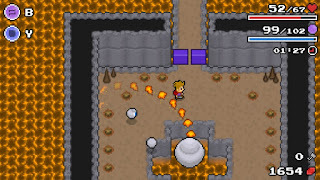 The gameplay in Stories of Bethem: Full Moon is like a 16-bit action RPG similar to The Legend of Zelda: Link to the Past. You have a large open world to explore but many areas require different magical spells to open them up first. The game doesn’t have any sort of melee attack, surprisingly, and instead relies entirely on wind or fireballs or other types of magic for attacks. It also sets itself apart from other similar games in that much of your time is spent solving puzzles instead of fighting enemies. You still fight enemies, of course, including boss fights at the end of each dungeon, but most of the time you’re solving puzzles. Stories of Bethem: Full Moon is the tale of a young man named Khoma whose father was cursed by the Blue Witch. In order to remove the curse, Khoma must find several magical artifacts scattered around the world. And that’s pretty much it for the story. They tell you why you have to do something, and then get out of the way for the next 20-hours or so and let you do it. I love it! The main plot is simply spelled out like this early on, but you can also talk to the dozens and dozens of NPCs all over the map to fill out the story of the world of Bethem. The writing for the NPC dialogue is surprisingly well done (aside from a translation error or typo here and there …) and generally pretty funny, especially the friendly Red Witch who has taken quite a liking to Khoma while helping him on his quest. You’ll definitely want to talk to all of the NPCs you can, too, because Stories of Bethem is full of world-spanning side quests. One character wants you to collect candy for her. A witch wants medallions in exchange for upgrading your magic. Special feathers allow you to unlock portals that teleport you around the world. There are monster auras to collect. HP and MP upgrades to find. A lengthy trading circle quest. And much more. It is kind of overwhelming, to be honest, because it becomes increasingly difficult to remember who needs what and where to go next because there is just so much stuff to collect. That is really my only complaint with Stories of Bethem: Full Moon – it doesn’t nudge you in the right direction nearly often enough. I know that is a totally oldschool game design choice – classic games didn’t have to hold babby’s hand every step of the way, darn it! 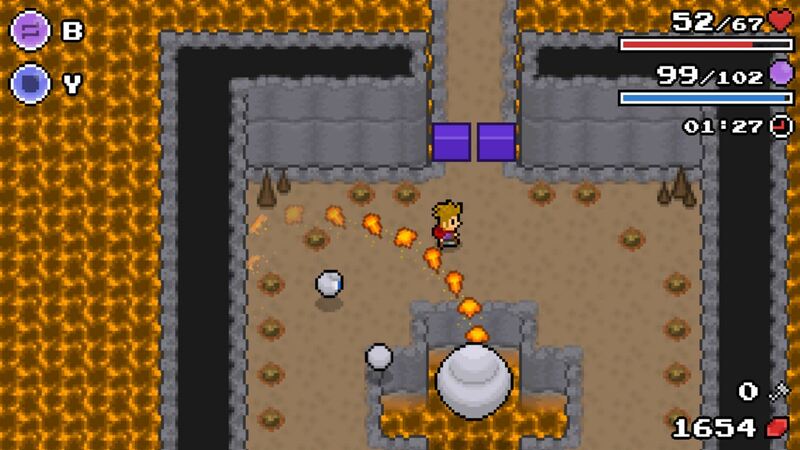 – but Stories of Bethem’s world and sheer number of side quests are a bit more confusing than our oldschool favorites. Since you don’t know what to do next – and the game putting a big red “X” on the totally worthless world map doesn’t really help at all – you end up just backtracking over every square inch of the game world using your new abilities to try to make progress. On the plus side, though, all of that wandering around greatly helps you find the items for the various side quests, but at the same time it is frustrating because you spend way too much time feeling like you’re not making progress. As long as you keep grinding away you do end up where you need to be, of course, and Stories of Bethem: Full Moon is a pretty enjoyable experience overall. 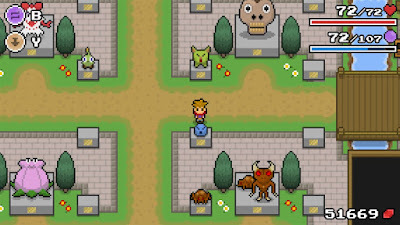 The magic-focused combat is fun and works well, the dungeon designs are great, the puzzles are just the right difficulty level of not being too challenging but making you really think for a few minutes, and wealth of things to do in the world is impressive. Also, while the Link to the Past comparison I made above is the obvious one most people will make, I actually think the game has more in common with Link’s Awakening in terms of world layout, quest design, and definitely in the sense of humor. 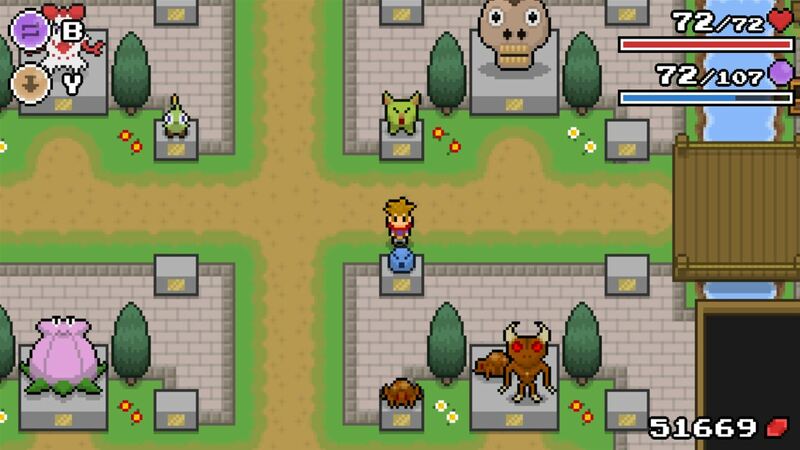 Borrowing from two of the very best Zelda games isn’t a bad formula to follow, if you ask me. A big part of Stories of Bethem’s oldschool appeal comes from the presentation and they really nailed it here. The game looks a bit like a cross between Link to the Past and Earthbound and looks great in all of it’s 16-bit-style glory. The music is also fantastic, though some themes can get a little repetitive (mainly the city theme). I was also a bit surprised to hear the same track in this game at one point that is also the main song in I, Zombie. Kinda weird, that. All in all, Stories of Bethem: Full Moon is a great 16-bit throwback action RPG that looks and sounds fantastic, plays well, and has a surprisingly dense world full of things to do. It could do a better job of pointing you in the right direction now and then, but it is a ton of fun overall that is just the sort of classic gaming experience I’ve been growing increasingly hungry for over the years. If you long for the 16-bit days when RPGs reigned supreme, Stories of Bethem: Full Moon is highly recommended. Even better, it’s an absolute steal at just $8 so there’s no reason not to buy it.